The world seems to be undergoing a sustainable energy revolution. For instance, Dubai, home to one of the globe’s largest solar energy plants, aims to use it to generate about 75% of its electricity by 2050. China, which has a wind-power generating capacity of 149 gigawatts, aims to raise this to 495GW by 2030. What does that mean in real terms? Well, a solar plant in Australia that also aims to generate 495GW plans to use it to run 90,000 homes a year. But even though the use of renewables is expected to grow faster than fossil fuels, the US Energy Information Administration (EIA) says coal, oil and natural gas will still account for 77% of our energy in 2040. This is particularly true for developing nations such as Nigeria, Malawi and Niger. These typically have have higher populations of people aged under 15 (almost 45%) than more-developed OECD countries with mature economies. These up-and-coming nations - along with India, which has a young population of almost 28% - will be looking to literally fuel their economies with growth industries so they can cash in on their “youth dividend”. Their businesses will, in turn, literally need energy to run. Meanwhile OECD countries with older populations and economies will be reducing their fuel consumption just as the up and coming nations are increasing theirs. 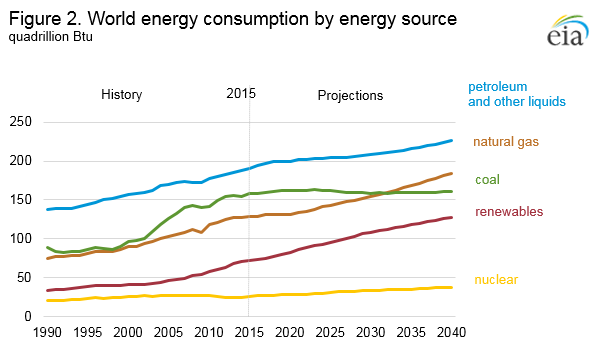 Despite this apparent trade-off, the EIA reckons that total world energy consumption will rise by nearly 30% by over the coming decades. World use of petroleum and other liquid fuels will increase from 95 million barrels per day (b/d) in 2015 to 104 million b/d in 2030, and 113 million b/d by 2040. Liquid fuels will continue to provide most of the energy consumed by the transportation sector and will rise an average of 0.7% a year to 2040. Transport will account for 60% of the total increase. Natural gas will account for the largest increase in world primary energy consumption after renewables. It burns more cleanly than coal or petroleum and as more governments begin implementing national or regional plans to reduce carbon dioxide (CO2) emissions, they may turn to it more. Global coal production is likely to remain steady at about 9 billion short tons from 2015 to 2040, and consumption is likely to rise by 0.2% a year between 2015 and 2025, and then start declining. The top three coal-consuming countries are China, the US and India, which will account for around 70% of coal from 2015 to 2040. By 2040 India is projected to produce twice as much coal as the US. Production is expected to increase in Australia, other Asian nations (excluding China) and in Africa. How will this affect CO2 emissions? Well, the EIA says how all this will will affect nations’ plans to implement the 2016 United Nations Framework Convention on Climate Change (UNFCCC) is unclear. But it says energy-related CO2 emissions are likely to rise by 16%. The biggest increases will be in developing economies, while emissions in OECD states are likely to remain about the same as they are now. While this may seem worrying, others offer firmer and perhaps more cheerful projections. 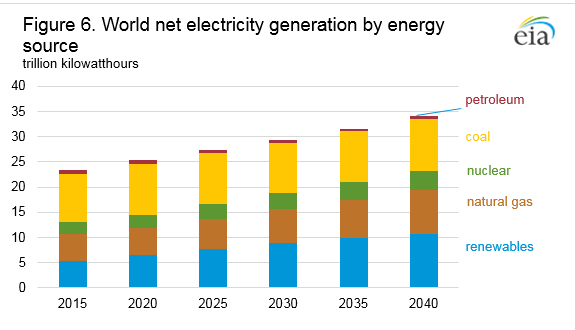 For example, ExxonMobil’s Outlook For Energy: Journey to 2040 optimistically states that “with population growth up 25%, global emissions [will] only rise 10%, with emissions peaking in the 2030s and then [start] declining”. Who knows, perhaps the future may yet be cleaner and greener than the EIA thinks.